One of Fortnite’s rarest (and spookiest) skins is back in the item shop. Skull Trooper first appeared last year, when the now world-dominant battle royale was still in its infancy, and is now finally available for purchase again. But this time around, it comes with its own set of challenges. 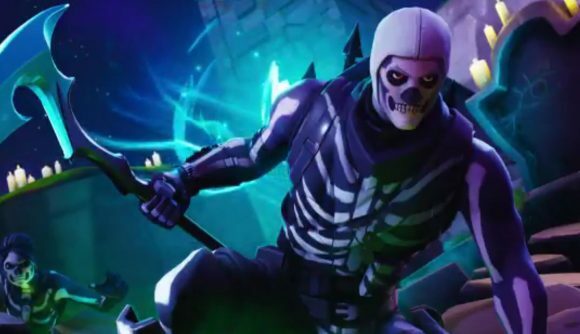 The Fortnite Skull Trooper Challenges are unlocked after you’ve bought either Skull Trooper or his female counterpart, Skull Ranger. After that, you’ll see a new set of tasks to complete in the game’s ‘challenges’ tab. Completing all five of them will grant you another exclusive cosmetic – this time out, Skull Trooper comes with the ethereal Ghost Portal backpack. This isn’t the first time Epic has used specific skins to promote new challenges. During Season 5, players who owned the Tomatohead skin could complete tasks to unlock a new, tribal look for the mascot-themed cosmetic, ahead of the transformation of Tomato Town into its new form, Tomato Temple. As well as getting that new back bling for completing the set, each challenge comes with its own XP reward to help you complete your Battle Pass. As you can see, those challenges are relatively easy to complete just by playing the game, and they’ll also make it a lot easier to rack up some extra XP – which in turn will make your Fortnite Calamity Challenges a lot easier to complete. You’ll need to own Skull Trooper or Skull Ranger to unlock these challenges, but you won’t need to be wearing the skins to make progress with the challenges. If you’ve not managed to pick up the skins during their current stint in the shop, then keep your eyes peeled in case they show up again this spooky season.